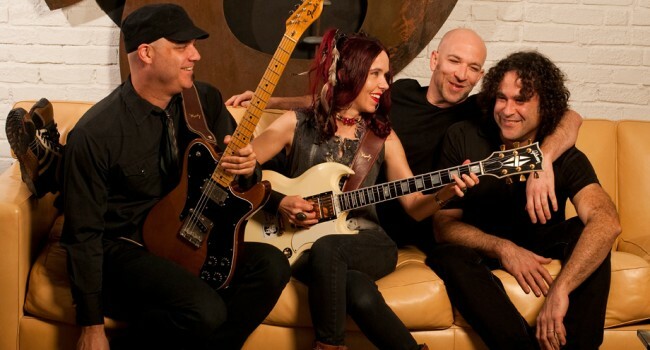 Forged in the storied Wicker Park section of Chicago by vocalist Juliette Tworsey and guitarist Jules Shapiro, FireBug began cutting their musical teeth in and around local Chicago venues before making their way out to Los Angeles. Since arriving in Los Angeles, FireBug have become a part of the essential club scene sharing the stage with many artists including Tom Morello (Rage Against The Machine), Abby Travis (Eagles Of Death Metal), unplugged sets at the Hotel Café with new folk artist Jesca Hoop (Tom Waits), and even performing acoustic with classic 60’s folk icon Donovan. The band has also received high praise from various publications such as HITS Magazine, Time Out NY and LA Weekly, who compare the FireBug sound to that of a new millennium version of 70’s rock, with each song being stamped with their own unique signature. FireBug’s touring efforts over the past year have garnered a core fan base, and over 60,000 “friends” on MySpace. They are currently working on their upcoming U.S. & European tour. Their music can be gentle one moment, then fiercely aggressive the next. Their expertly woven hard rock/indie/blues sound with a bit of Irish/British influence is brought home by the sweet, slightly psychedelic, but intense vocals of Juliette Tworsey. Taken independently, there are songs in the band’s repertoire which could be classified as indie, blues, and even psychedelic. In the final analysis, FireBug are out to establish a new game, and people want to hear what all the noise is about. In so doing, FireBug have performed at CMJ in New York City, and were showcased at NorthByNortheast in Toronto, the largest music conference in North America. FireBug have toured the UK three times, with a recent memorable performance in Knebworth at the sold out 2010 Sonisphere Festival with Iron Maiden, Iggy and the Stooges, Alice In Chains, The Cult, Good Charlotte, Papa Roach and many other major acts. In London, FireBug has performed in famous venues such as Dublin Castle, The Halfmoon and The Rhythm Factory. They were voted best DIY songwriters and Winner of the UK New Music Video Awards, and have won Best International Act two years in a row (2009 & 2010) at the UK Exposure Music Awards (sponsored by ToursDates.co.uk). FireBug also has performed many shows in New Orleans including Satchmo Festival, and Stand Up for Haiti, February 2010. The highly acclaimed NewOrleans.com did a spotlight on them performing in the French Quarter on Royal and St. Ann for the Dirty Linen Festival. In September 2011, FireBug was selected to perform in Downtown New Orleans for the Cutting Edge Music Festival in Lafayette Square. Other New Orleans venues include Cafe Negril, BMC, Hi-Ho Lounge, Hard Rock Cafe and Circle Bar. On the band’s schedule are famous venues like the Viper Room in West Hollywood, California; The Echo in Los Angeles, Bordello in Los Angeles, and House of Blues. Over the past few years, FireBug have hosted the quarterly, and much sought-after, FIRELIGHT! Music Festival located in Silver Lake, the heart of Los Angeles’ hot new music scene. FireBug is currently working on their next album with producer Chris Goss (The Cult, Queens of the Stone Age, Stone Temple Pilots, The Duke Spirit, Arctic Monkeys, etc. ), with a planned worldwide release in 2012.